The XPF 416x50mm rifle scope with locking turrets features a DualIlluminated MilDot Reticle and Side Parallax Turret. The large thirty millimeter main tube is one piece aircraft aluminum. The scope has a large fifty millimeter objective for greater light gathering capabilities and is adjustable from four to sixteen power. 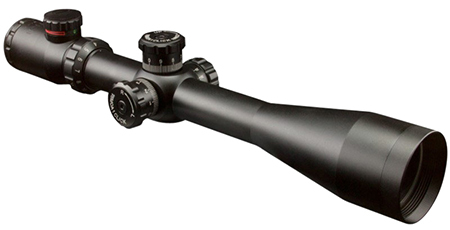 This scope is ideal for long range competitive shooters target shooters and hunters. It features both green and red Mil Dot reticles and rheostat switch to control the level of brightness. Windage and elevation knobs are both large easy to adjust with audible clicks and are both lockable. One eight minute of angle adjustment and a generous two to three inches of adjustable eye relief.